The theme of the regional conference, and a recurring element in much of Amnesty's work, is Moments to Movements: how do individual experiences and specific instances in time inform the broader communities and movements of which we are part? During the opening plenary, individuals shared what brought them to activism: a determination to see one's twin sister achieve equal rights to oneself; years spent in solitary; work among oppressed women in one's home country. 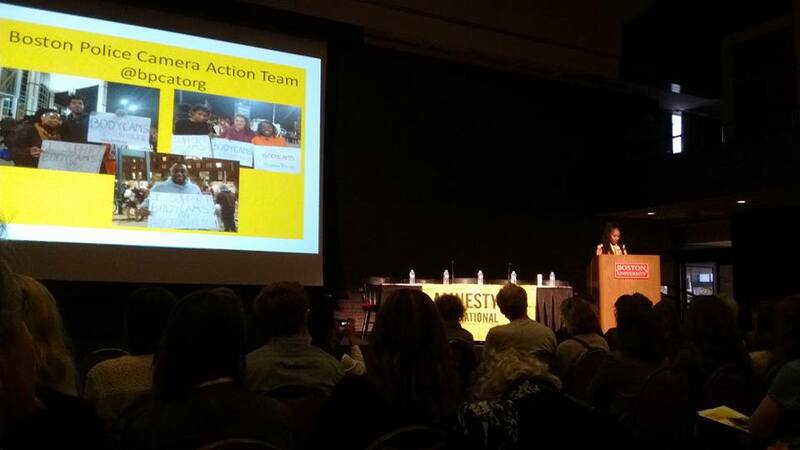 On the other end of the spectrum, it was emphasized that we are a Famnesty, part of something larger; Shekia Scott, one of the founders of the Boston Police Camera Action Team, pointed out that what happened in Ferguson was "not Ferguson issues" but American issues. Drawing these connections between localized experiences and systemic events enables us to more effectively build networks and take action. The first panel I attended focused on mass incarceration in the United States. I struggled a bit with this panel because while it was valuable and moving to hear the experiences and approaches of the three panelists, I did not feel like I learned anything new -- in the last couple of years there has been a surge of awareness and activism around issues relating to mass incarceration, and by this point I feel like I need more critical analysis rather than an introductory course. The inhumane treatment -- yes, we can call it torture -- experienced by those who spent time in solitary confinement or who were shackled while giving birth must be recognized, felt, endured, but Tufts Amnesty approaches its own panel on solitary confinement next week, I want to keep in mind that we must find those connections between personal experience and collective action. Perhaps the most frank quote of the panel came from activist Carol Eady-Porcher: "The system is not broken. It does exactly what it was supposed to do: Keep poor people poor, keep sick people sick, keep imprisoned people in prison". Former prisoner and prominent activist Johnny Perez also called for culture change, pointing out that "we're a punishing society" and that something fundamental must shift in how we define and treat crime. Conference attendees then had the opportunity to choose from an impressive array of workshops. As the president of our club, I chose to attend a session on Creative and Strategic Planning. I readily admit that our club tends to operate from event to event without an overarching vision -- sure, we are committed to human rights and that drives everything we do, but we've never had a cause or a goal extending through the semester or the year. The workshop, drawing on some of the theory of collective action/grassroots organizing, laid out knowledge, resources, tactics, and planning necessary to move from the decision to take action to actually achieving a goal. Again, I felt like I had learned most of this (I've attended the conference three times and served as an Amnesty Student Activist Coordinator for a year), but it was a helpful refresher and a reminder that we could be doing our own club's work with more direction. After lunch, all voting members -- dues-paying members, student group members, and leaders of student or local groups -- had an opportunity to vote on two resolutions which were up for discussion. I don't know how much of the information about the resolutions needs to remain internal to the organization for the time-being, but one of the resolutions involved an issue which we had discussed just last week at our weekly meeting. The discussion was heated and the vote was close; I think it was a powerful experience for all of us, and gave us a bit more insight into the participatory process which governs Amnesty. There is definitely a lot of critique and criticism of Amnesty International and AIUSA's model and procedures, so there's more to learn. My last workshop was run by representatives from the Inside Out Project, the largest art project in the world. Inside Out enables people around the world to use portraits to tell a story or promote action. Especially given the success of the Humans of New York project, it is clear that candid, vulnerable pictures of individuals speak deeply to us all. I would love to find a way to incorporate Inside Out into our work -- as I've mentioned, Amnesty's work is very centered on telling stories, and portraits hold a lot of power in that regard. This was my last conference for the foreseeable future -- who knows where I will be nextyear! -- so it was with mixed emotions that I attended! I saw my peers from when I was an SAC, local group members from all across the Northeast whom I have seen doing this work for four years, and freshmen from our own Tufts group experiencing the conference for the first time. I hope we all came away with a little more passion, vision, and motivation! By Stina Stannik, President of Tufts Amnesty.